A couple of weekends ago, I stayed with a friend who is about as connected to the virtual world as one can be. He makes me look like I’m still pulling an oxcart. ‘Retired an internet millionaire at 35. ‘Built several internet-related companies from the ground up. ‘Launched one of the very FIRST websites. Uber-smart. His house is a porcupine of wires, routers, cameras, studios, monitors, keyboards, and remotes. 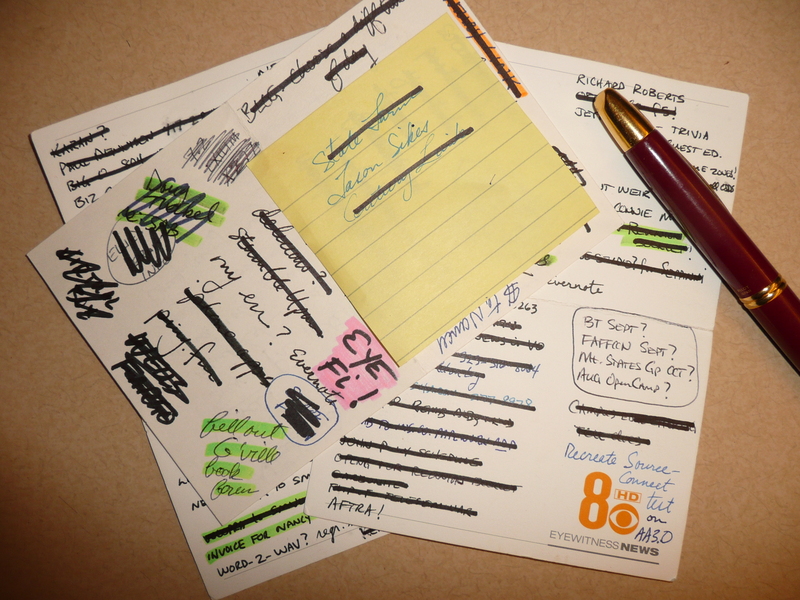 But, one morning as I strayed into his main office — there…on the desktop… a pen and a pad of paper filled with line after line of his to-do list. Written in pen and ink. Some of man’s most basic ideas are hard to beat. I think e-books will eventually replace paperbacks, but mark my words, there will be a “Book Anachronistic Society” to ballyhoo the advantages of words printed in ink on a page of paper. Excellence and good content never go out of style. You can change the medium, but there will ALWAYS be a need for good writers, creative performers, and fresh ideas. As a unique and genuine voice performer, you will always be someone’s pen and paper.